1. Is the fretboard already finished? It sure looks like it. It looks slightly glossy, like it has a coat of tung oil on it already. Do I need to do anything else to it? The Carvin instructions basically say "no". 2. 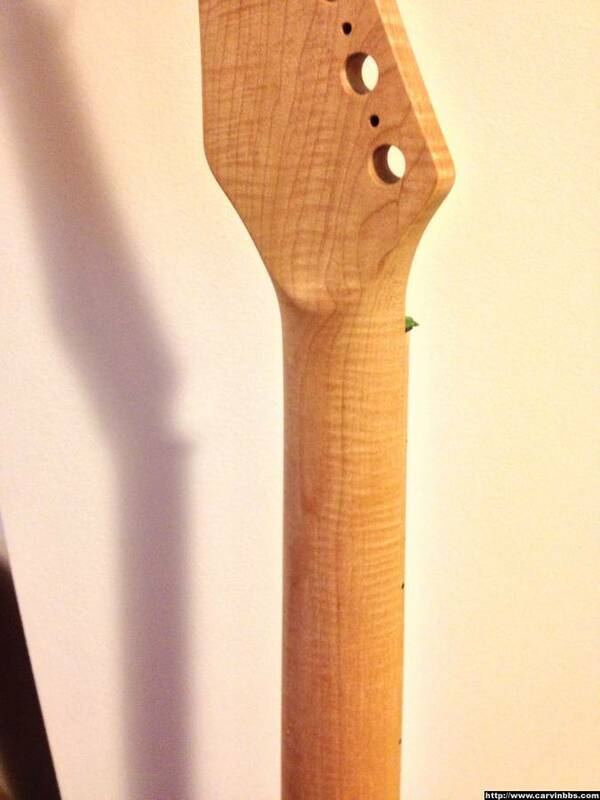 I want to tung oil the whole neck and headstock to bring out the grain and get that nice smooth feel. 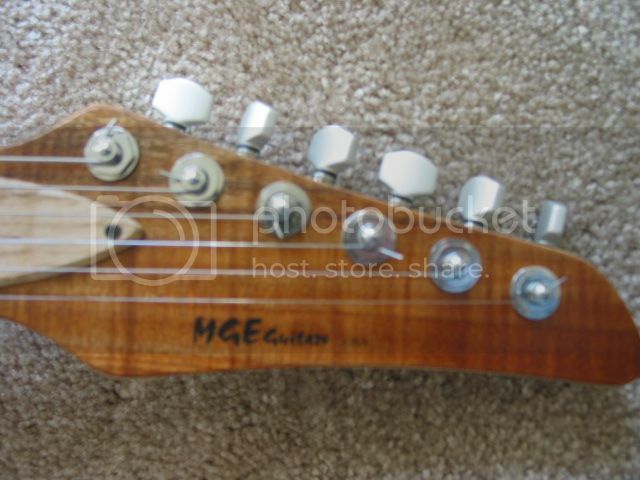 I also would like to do some sort of decal on the headstock. Thus....what (if anything) can I clear coat with over the tung oil to bury the decal? I'm using Minwax brand Tung Oil that Carvin recommends. You can get in in gloss or semi-gloss. As far as the kit fretboards, the maple ones are finished with tung oil. Ebony and rosewood have no finish. If you don't want to finish the back of the neck yourself, you can order it with a clear gloss, clear satin or tung oil finish from Carvin. And, just to be clear, I only used the product above on the body and headstock overlays on my kits. The fretboards and back of the neck came finished with tung oil from Carvin. Last edited by mge80 on Mon Nov 12, 2012 7:10 am, edited 3 times in total. PS I have half a can of the acrylic enamel left over.....wonder if that would work over tung oil? Stone Temple Pinot wrote: PS I have half a can of the acrylic enamel left over.....wonder if that would work over tung oil? If you're talking about using it over a decal on the headstock only, try it first on test material to be sure ... but in general, if you're going to use any other kind of finish, there's no point in applying tung oil .. you lose all the benefits if you cover it with a different finish. I got really lucky, and received a neck with a bit of flame on the neck and headstock. So my logic was to tung oil it first. I really want it to stand out. I'm open for ideas of solutions that would give me the results with the grain and let me bury a decal. Virtually anything you apply to wood will make the grain more apparent .. you can try wiping it with a little turpentine or mineral spirits .. or even a rag damp with water .. and see the grain become more visible. In that regard, tung oil will be no better than wipe-on poly or lacquer. The biggest benefit of tung oil is that silky smooth finish you get .. almost like bare wood .. but with the sealing and protection of a finish. If you really want the grain to pop, consider applying a bit of stain, followed by removing it immediately with a rag. Dyes could work for this too. The grain in wood gets its appearance by the different densities of the grain .. parts of the wood are more porous (less dense) and accept a finish more than other parts, which are less porous (more dense). The softer parts of the wood soak up the finish, while the harder parts soak up less of it. Applying a stain or dye and then immediately removing it leaves the softer parts of the wood with more of the color, and thus accentuates the grain. This is basically what the DTS (deep triple step) finishes are about. The wood is dyed black (or very dark), and then sanded back so that the black is only in the softest part of the wood, then a colored stain/dye is applied, leaving a high-contrast appearance. You could apply tung oil, poly, lacquer, etc over the colored wood. The decal is a special case. 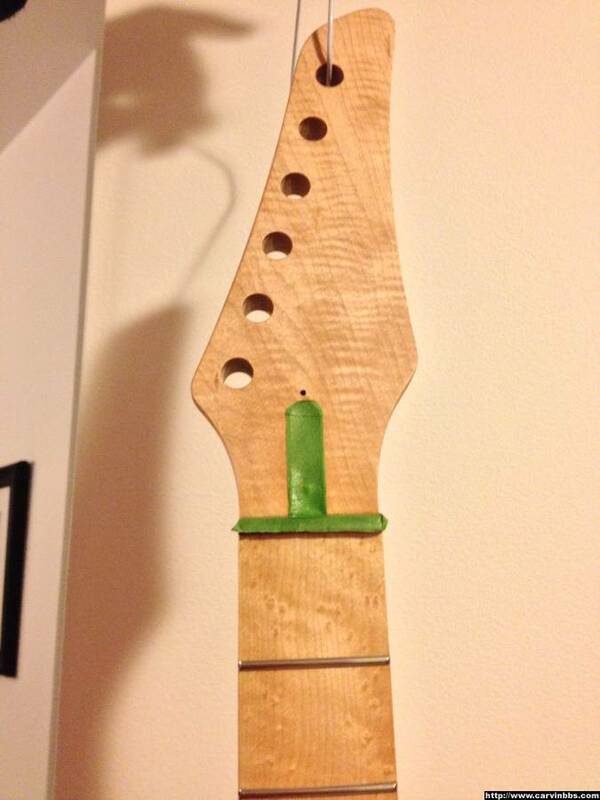 Color/finish the headstock as desired, apply the decal, and then you'd probably want to protect it with poly or lacquer (on the face of the headstock only). I don't think tung oil would work well for that .. it really wants to soak into the wood and polymerize .. the decal would prevent that .. I apologise if I'm telling you anything you already know. Bottom line is that there are no rules .. a piece of test stock and some experimentation is your best guide. Wood is very forgiving, mistakes can be sanded away. I finished a bolt plus kit with a quilted top in a DTS-type blue finish ... it took 3 tries to get it to look the way I wanted... Visualize what you want, and then make it that way ..
That really helps a lot. I appreciate it. 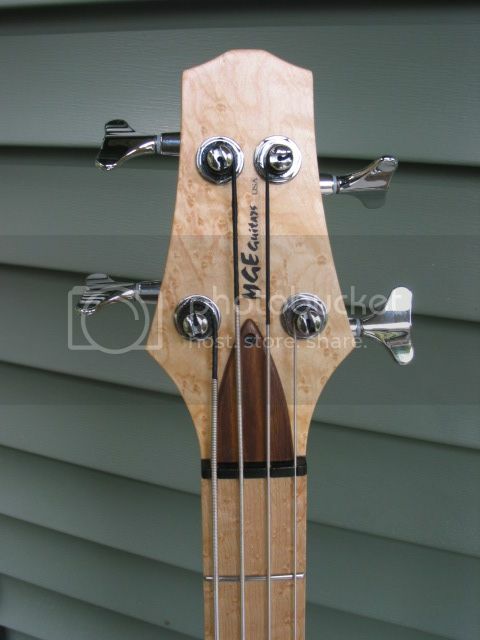 After reading that, I think if I switch gears slightly and do a very light stain over the whole thing, then I can tung oil the back of the neck and headstock and lacquer the top of the headstock with the decal. Would you be able to recommend a good color of Minwax stain to start with on the maple, that could pop the grain a little? My gut says "Natural", but my inexperience makes me second guess. I'd be willing to grab two or three colors to test. Since the fingerboard is already tung oiled, I don't want to get too dark or drastic. I tested Minwax "Natural" stain, "Golden Oak" stain, and tung oil only on some scrap maple. Honestly, I saw no difference in tung oil and the natural stain. The golden oak stain just made the maple too muddy looking, and didn't help much. It almost seemed that it got too much in the pores, and darkened the pores along with the grain. Thus the muddy-ness. So...I stuck with tung oil only, then I'll bury the decal with some Minwax gloss spray lacquer. I feel REALLY lucky to have this neck in a bolt kit...considering it was luck of the draw. The flame on the headstock and neck, and birdseye on the fretboard isn't super crazy, but I'm super thrilled for what it does have. It's hard to capture in photos, but the flame goes all the way down the back of the neck, and the birdseye is all the way down the fretboard. How easy is it to bury a decal in the wipe on poly? But, on both of my kits, I used General Finishes products..."Seal A Cell" followed by "Arm R Seal". They are oil based urethane products designed to be used together. I used a number (quite a few...maybe 10-12) very thin (as thin as I could apply it) coats of each, and before the last few coats of Arm R Seal, put down my decal. The Arm R Seal covered it nicely, sealed it in, and it has remained pretty much the same since the day I did it....years ago. Now I'm kind of stuck finding something worthwhile to go over the Minwax tung oil. STP Unfortunately I really DON'T think that you're going to find ANYTHING that is meant to be put over Tung oil. Tung oil in general is a FINAL COAT/FINISH. I would HIGHLY RECOMMEND NOT PUTTING ANYTHING OVER THE TUNG OIL. Sorry dude, but you'll just screw up the finish if you do. The ONLY solution would be to sand off the tung oil, however if you've applied several coats, then you're still going to have trouble putting any other kind of coating over it since its already soaked into the wood. I ended up sanding off the tung oil, and so far the lacquer is holding up fine....the decal however, is not. It was fine when I put it on, and I let it set for two days. After a couple more days it started to develop moisture underneath it. It has about 12 coats of lacquer on it, so I'm keeping it for now. I'll redo it someday. Minwax tung oil finish is not tung oil. Most modern tung oil finishes are not even a little bit tung oil. Instead they are thinned laquer. They usually thin it 3:1 or 4:1 and this essentially becomes a rubbing varnish. It's incredibly easy to work with and has a very nice and had finish when it sets. Tung oil takes almost 30 days to set and can take months to fully cure. I'm sure you have noticed that minwax dries much faster. I've made quite a few pieces of furniture that I have finished with rubbing varnish and it is easily my favorite finish. 30 coats on my homemade telecaster and I had a finish that was almost as hard and glassy as a poly but unlike poly it feels like wood. Had you placed your decal under the first coat it would have been fine. Put a sticker on a piece of scrap wood and pour some of that minwax on it, it'll harden over it just like any other laquer. I'm no expert, but went through that. Basically, you can't put a lacquer over PURE tung oil. It takes not so long to dry, but to CURE, it takes a lot of time (weeks, correct me if I'm wrong guys). 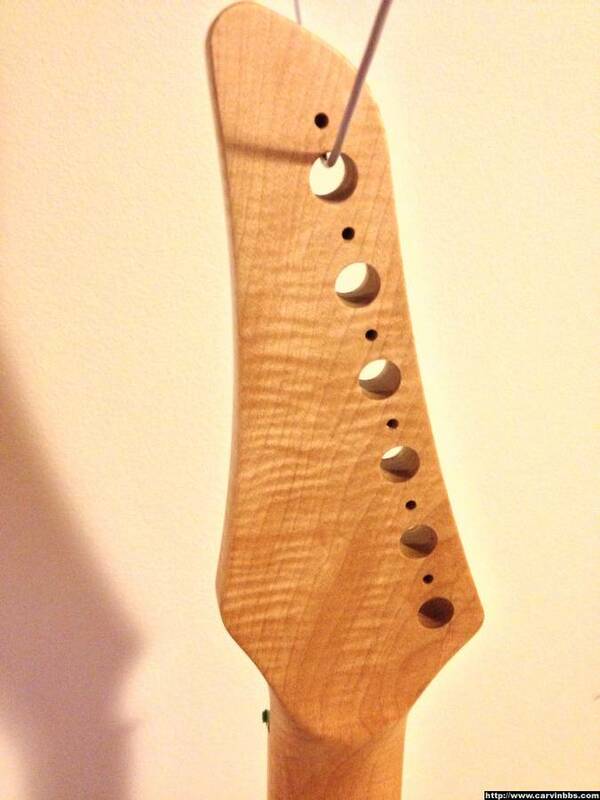 For the decal, you should have tung oil the neck minus the face of the pegheead (where the decal sits). Then, depending of the decal, you could have put a coat or two of your compatibile finish like nitro or poly, put the decal, and then go REALLY gently with your finish (light coats). after the required coats, put the decal and finish. Some decals are not meant to be put on raw wood. Again, no expert, but I think I'm right on that topic. Good luck and most importantly, have fun. I had a BLAST. Money can't buy hapiness, but it sure can buy guitars.